The IMBA and the STC (Sustainable Trails Coalition) issued a joint statement declaring their cooperation to work together more productively than in the past. The intention is to encourage supporters of both organizations to pull together when opportunities arise. Next Chapter meeting at River Bends on Tuesday, July 12 at 5:30 PM (rain-out day July 13). Jeremy Verbeke to reserve pavilion. Food? Pontiac Lake Recreation trail coordinator – maybe Zendra? Membership. Current membership stands at 319 current and 33 recently lapsed. We signed up 7 new members at the Island Lake event. Andy from IMBA gave us Kudos! 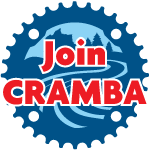 Mike Fitzpatrick suggested that we set up the CRAMBA tent at the trail head at Stony and solicit members. Jeremy Verbeke said we really don’t need permission from the park to do this. Kristen reported that we have $14,000 in the bank. Our 10 x 15 storage renewal is coming up at $550.00 per year – apparently a really good rate – so we’ll renew. Next board meeting will be on June 23 instead of June 16 to avoid a conflict with Waterloo’s Grand Opening. It will be at the Fitzpatrick Pub. Meeting adjourned about 8:30 PM.